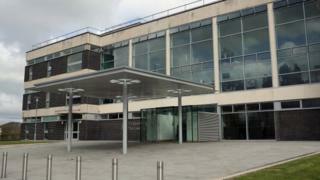 A man from Wrexham county borough who tried to strangle his wife in bed has been sentenced. Nigel Leech, 53, of Cilcoed in Chirk, admitted two charges of assault following the incident in the early hours on Monday. Flintshire Magistrates' Court was told he became paranoid and wrongly believed his wife was having an affair. He was given a 26-week prison sentence, suspended for two years, and must carry out 180 hours of unpaid work. The court was told when Leech's two adult sons came to their mother's rescue, Leech left but returned with a kitchen knife and during a subsequent struggle ended up assaulting one of his sons. His wife suffered cuts to her hand and bruising to her throat. Magistrates heard there had previously been no violence in the 33-year relationship and the attack had come "out of the blue". Bethan Jones, defending, said Leech accepted how terrified his wife and family must have been. Leech was also banned from the family home for the next two years, and ordered to pay £85 costs and a £115 surcharge.